When creating city tours, it is important to draw and position an object’s trigger-zone correctly. Each trigger-zone belongs to a particular object on the tour and is responsible for activating the audio story about this object. The audio story will automatically start playing once the tourist crosses the boundary of a trigger zone. 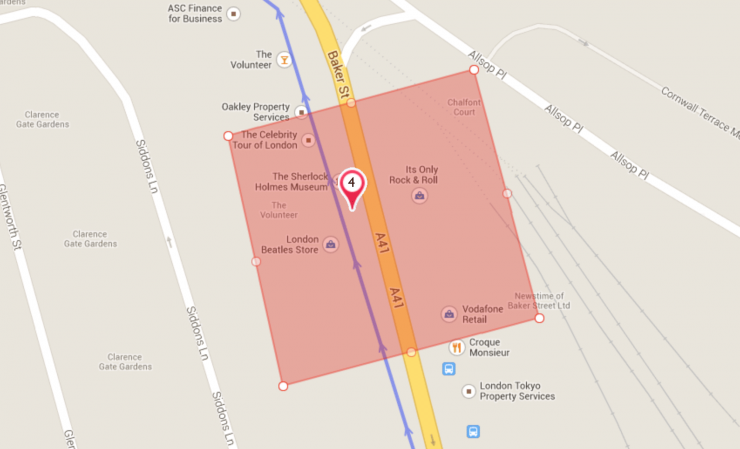 Determining the position of tourists (and hence their entry into a trigger-zone) is achieved using their smartphone. When creating trigger-zones, therefore, it is important to consider several issues regarding how they work. Below are a number of simple recommendations regarding how to create trigger-zones. 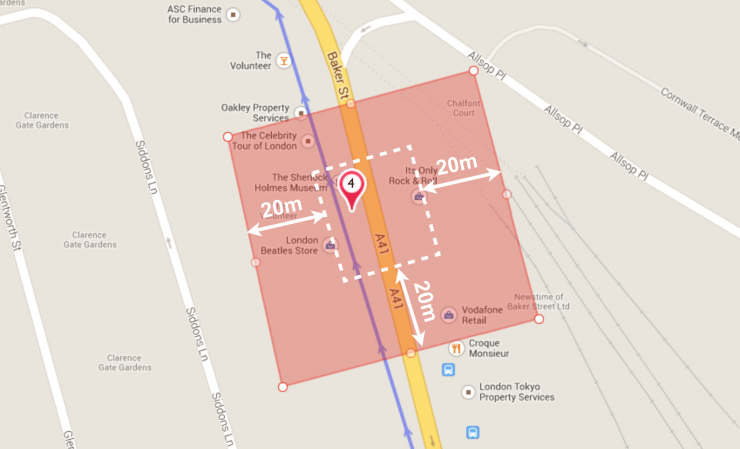 When creating a trigger-zone, take into account the margin of error when determining a tourist’s position using a smartphone.To compensate for this error, widen the trigger-zone boundaries relative to the calculated values – allow for a certain ‘extra’ area. It is recommended to make the trigger-zones at least 30 meters wide. The margin of error when determining the coordinates in a city environment can rise to several meters, and a smaller trigger-zone might simply not work. In moderately built-up areas, increase the trigger zone by 10-15 meters in each direction, relative to the calculated boundaries. On the image below, the calculated boundaries are marked with a white dotted line. In heavily built-up areas (where there are skyscrapers or narrow streets in city centers), the potential accuracy of determining a tourist’’s position drops. 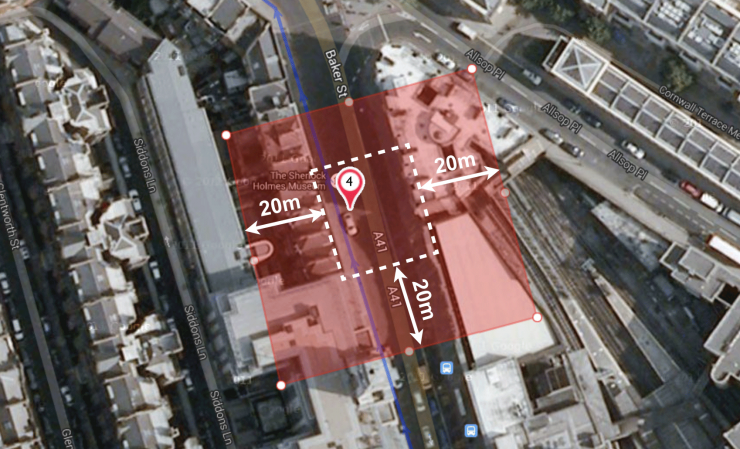 The trigger-zone boundaries therefore need to be increased by 15-20 meters in each direction. Important: When drawing trigger-zones, take care not to make them too large. In this case, the tourists might hear a story too early, before they have reached the object, or even while on a nearby street. 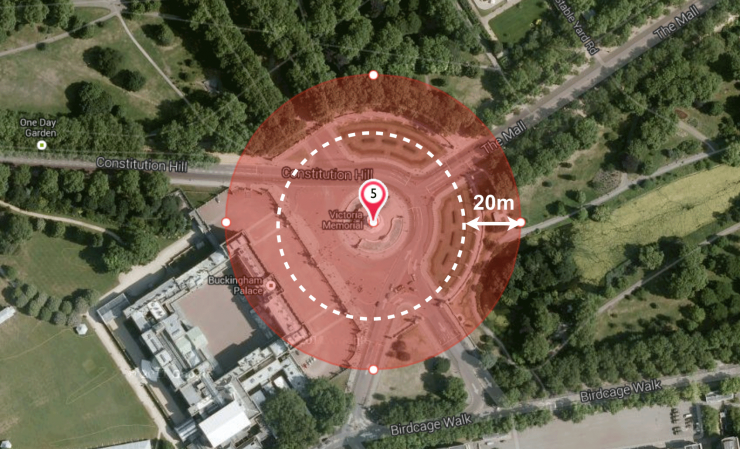 The optimum trigger-zone size is the distance that can be covered in 1-1.5 minutes (65-100m on foot, 200-300m by bike). A trigger-zone should not cross itself, nor contain sharp angles or very narrow areas. Combined with a low level of accuracy when determining a tourist’s position, all of these can lead to a failure to activate the story. Try to avoid using complex shapes when forming the trigger-zones. Remember that the margin of error when determining the tourist’s position can be several meters, and any unnecessary precision and complexity will not help to reduce this. The most commonly-employed trigger-zone shapes are circles and rectangles. Circles are suitable for intersections and irregularly-shaped zones. Rectangles are best suited to areas along the streets and level spaces. We recommend using these two shapes whereever possible. Assess how the trigger-zone appears not only on the map but also on a satellite image. A map might oversimplify or provide an inaccurate representation of the area. Carefully check all of the tour’s elements together (the objects, trigger-zones, and overall tour route). Ensure that the trigger-zones’ size, shape and position, relative to each other, correspond to your intentions. Always test the tour yourself using the audio guide. 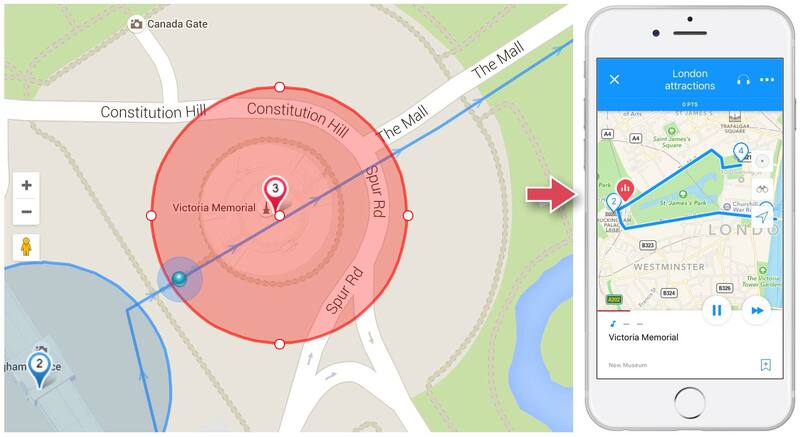 For the test, we recommend turning on the trigger-zones on the audio guide map. This will allow you to see yourself entering and leaving the trigger-zones. While testing the created tour, you will receive objective information about the accuracy of the trigger-zone placement and the audio stories’ length. Based on this, make corrections to the tour, changing, wherever necessary, the size and position of the trigger-zones and the length of the audio stories. After that, check the tour once again while on location.